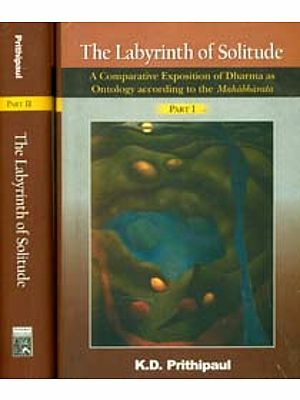 These essays while manifesting the depth of scholarship of Professor Kali Krishna Banerjee and his familiarity with both Indian and Western philosophies, reveal his dexterity in dealing with the intricate problems of both the systems of philosophies in an original and creative manner. In these essays he recognizes the importance of language can be made to signify a transcendent reality. The categorial scheme of metaphysical systems, however, is to be gleaned not from language alone but from experience and commonsense as well. Professor Banerjee suggests that some powerful theses of Indian philosophical systems are without a strong foundation. 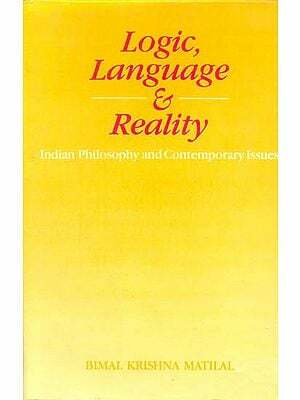 An Indian Darsana, he points out, is to a large extent, grounded in pre-logical insight into reality-a conception of a philosophical system which is totally absent in Western Philosophy. A metaphysical system must be creative and grounded in one's deeper quest for identity. Philosophy is a personal and a historical search for Being and not merely theoretical and abstract rationalization. Professor Kali Krishna Banerjee was one of the leading philosophers of contemporary India. His untimely passing away came as a shock to most of us. Both in Indian and Euro-American philosophy his interest was broad, deep and interpretative. His ability to creatively synthesize the ideas drawn from different sources is marked by originality and insight. Though prolific as a writer, Professor Banerjee was evidently not very particular about the style of his presentation. Besides, he was rather indifferent to the uneven quality of the journals in which he published his professional papers. This volume could not be published without the co-operation of his son, Shri Kishore Krishna Banerjee, who preserved the manuscripts of his father with exceptional care and was pleased to hand them over to the ICPR. 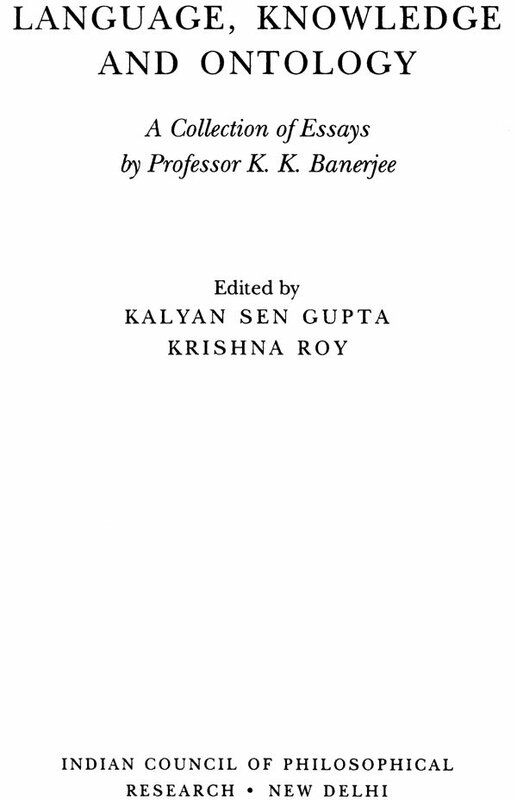 Dr. Kalyan Sen Gupta and Dr. Krishna Roy, the editors of this volume, had the privilege to work with Professor Banerjee intimately and for a long time. It was not an easy task to convert the author's manuscript in the form of a book; for their painstaking editorial work I am especially grateful to them. In this difficult scholarly work they have been greatly assisted by Dr. Tapan Chakraborty, Professor S. R. Saha and Shrimati Srilekha Dutta. Shri P.K. 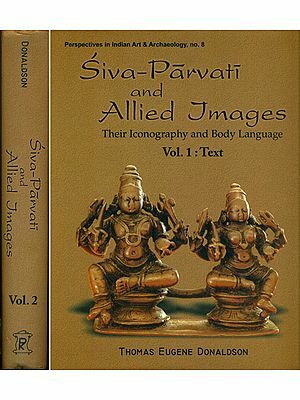 Ghosh, the printer of this volume, gladly took upon himself the unconventional and academic responsibility of helping the editors to change, in some places, the form of the author's presentation in order to improve its intelligibility. Professor J.N. Mohanty's Introduction to this volume has added to its value. I take this opportunity to thank, on behalf of Indian Council of Philosophical Research, all those who have worked so dedicatedly in making this publication possible. A year or so after I finished my M.A. at the University of Calcutta, Professor Kali Krishna Banerjee joined the post-graduate faculty as a part-time lecturer. That must be around 1951. I did not, however, get to know him personally until I returned from Gottingen and started teaching in the same department. His reputation as an erudite scholar, brilliant teacher and subtle thinker had reached me. As I got to know him, I began to discover another aspect of his personality: he was a charming person with an unfailing sense of humour. We were colleagues for several years until he left for Jadavpur as a Reader. Our friendship continued. Whenever we met, we talked. He was an incomparable conversationist, with an inexhaustible store of stories, anecdotes, jokes, philosophical titbits; and of course we discussed philosophy. I knew of the deep tragedies in his life and the many physical illnesses he had suffered. I knew that these experiences had added, sometime in the late fifties and early sixties, a new dimension to his thinking. 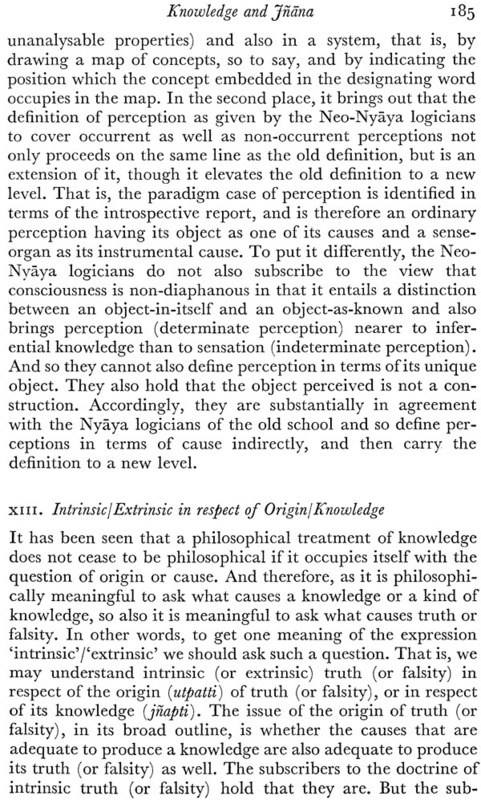 The Naiyayika became also an existentialist. For the rest of his life, as the papers reprinted in this volume show, he moved between these two extremes: Navya-Nyaya and Kierkegaard. Even in choosing his end, he showed faithfulness to analytic thinking and existentialist freedom. 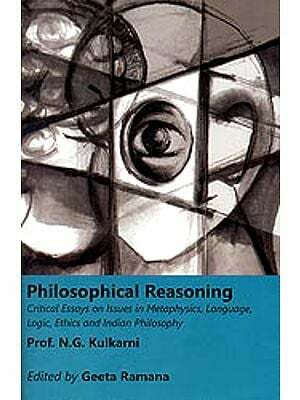 These essays show Kali Krishna Babu's scholarship in both Indian and Western philosophies. He moved in and between these domains with mastery and confidence-always to the point, always with an analytic spirit, and never failing to be original. In fact, in these essays he succeeds in making several interesting points. He recognizes, along with current philosophical preoccupations, the importance of language in philosophy, but refuses to use analysis of language for the purpose of demolishing metaphysics. On the contrary , he sees in language the possibility of meaning a transcendent reality. The categorical scheme of a metaphysical system, he insists, has to be gleaned not from language alone but also from common sense and experience (anubhava). He is not afraid of saying that some thesis of a powerful Indian system is mistaken. In fact, he argues as much against the Advaita Vedanta thesis that ignorance is a positive entity as against the Bhatta theory of 'knownness'. On other issues, he takes an intermediate position: neither the Nyaya theory of anuvyavasaya nor the Vedanta thesis that knowledge is self-manifesting–he argues–can be proved or disproved. 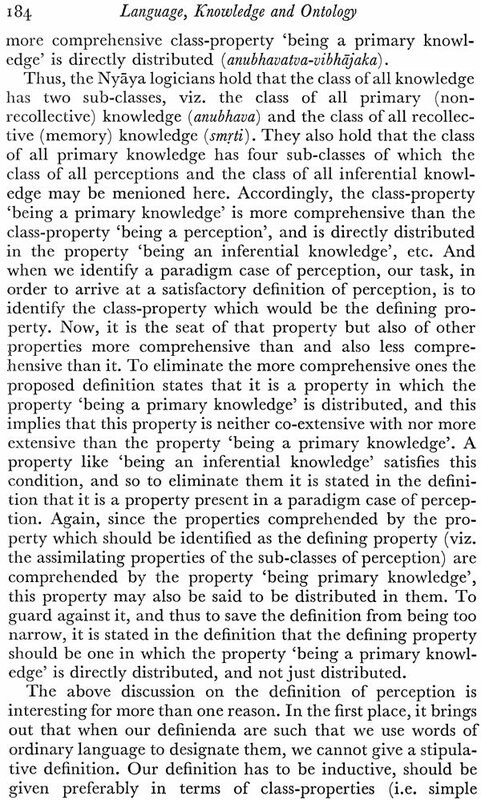 These assertions, he contends, are neither empirical nor a priori nor linguistic nor meaningless, but basic to the system concerned so that one's choice has both theoretical and extra-theoretical reasons. An Indian darsana, he insists, is a large point of view grounded in a pre-logical insight into reality: this conception of philosophical system is absent in Western thought. A metaphysical system should be creative and grounded in one's deeper quest for identity. Philosophy, as he eventually came to look at it, is a personal and also a historical search for Being. As I heard him over the years, his was an incessant quest to keep logical analysis and existential search for meaning together in proper balance. I trust this search will continue with those of us who are left behind.